A big change like Making Tax Digital (MTD) is bound to produce some uncertainty. If you’re confused, don’t worry, we’re here to shed some light on the situation. Below, we tackle 8 of the most frequently asked Making Tax Digital questions to clear up some of the confusion. Making Tax Digital (MTD) is a HMRC initiative designed to make the UK tax system more effective, efficient and easier for taxpayers by replacing manual processes with digital ones. HMRC is doing a gradual roll out of MTD, starting with Making Tax Digital for VAT. Those affected by MTD need to start following the rules from the beginning of their first VAT period, starting on or after 1 April 2019. Other components of Making Tax Digital, such as income tax and corporation tax, have been placed on hold until April 2020 at the earliest. But now is the time to start brushing up your knowledge and getting ready. How do I comply with MTD for VAT? All you (or your accountant) need to do is record your taxable records and submit your VAT returns through HMRC approved functional and compatible software – like inniAccounts. I’m an inniAccounts customer, can I relax? Yes. If you’re an inniAccounts customer don’t worry – it’s all taken care of. Our software has been confirmed as MTD-ready by HMRC. If we haven’t already, we’ll be in touch soon with a bit more information. What happens if I’m not using MTD compliant software? If you’re VAT registered with a turnover over the £85,000 VAT threshold, you need to switch to or find compliant software by April 2019 at the latest. You can find a list of all approved software providers here – inniAccounts is one of them. Can’t I just keep submitting my VAT returns through HMRC’s website? From 1 April 2019, HMRC’s online VAT return filing will close. All VAT-registered businesses with a taxable turnover above the VAT threshold, must comply with Making Tax Digital. The current exemptions for electronic VAT filing will be extended to cover Making Tax Digital for VAT. Companies registered for VAT, but with a turnover below the threshold, will be automatically exempt. However, you can voluntarily register, which we recommend. Why should I consider using inniAccounts? Whether you’re used to spreadsheets or tools like Quickbooks, our Making Tax Digital-ready software will knock your socks off. If you’re a little unsure about Making Tax Digital, it’s worth choosing someone who can help you every step of the way, which is what our Practice Excellence award-winning team always offer. Experience hassle-free, proactive company accounting for yourself. Whether you’re an existing client, looking for a hassle-free switch or simply want to brush up your knowledge – we’re here to make Making Tax Digital simple and provide you peace of mind. Preparing for digital tax starts with managing business accounts online. If you’re already using a competitive software like inniAccounts, the transition will be a smooth one. But if you’re making a change, it needn’t be a headache, MTD is a great opportunity to streamline your accounts and make your life easier with great software. 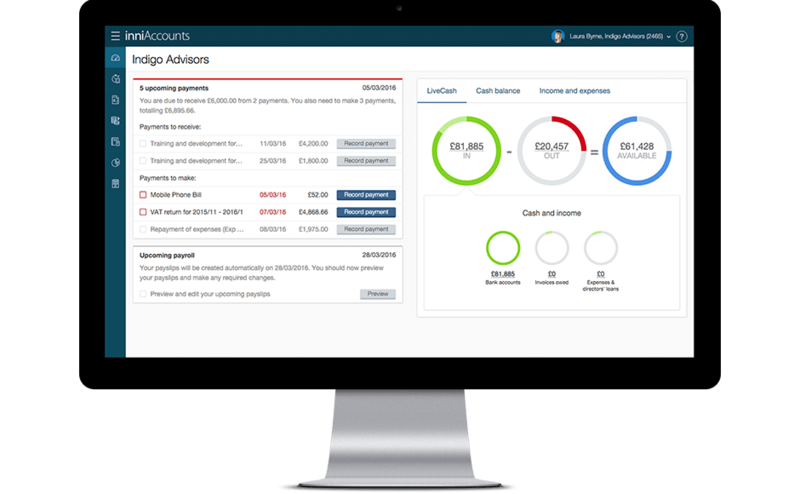 Learn how inniAccounts can help you with Making Tax Digital today.